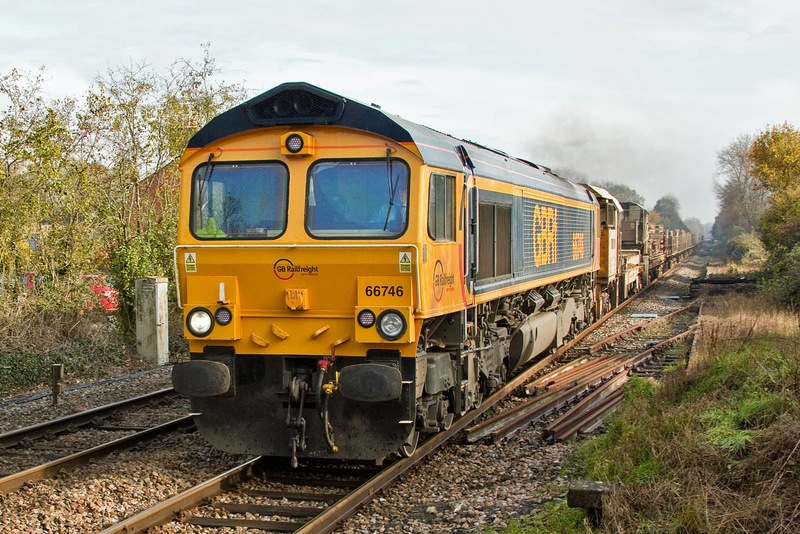 GBRf now have the Railvac activities in this area. 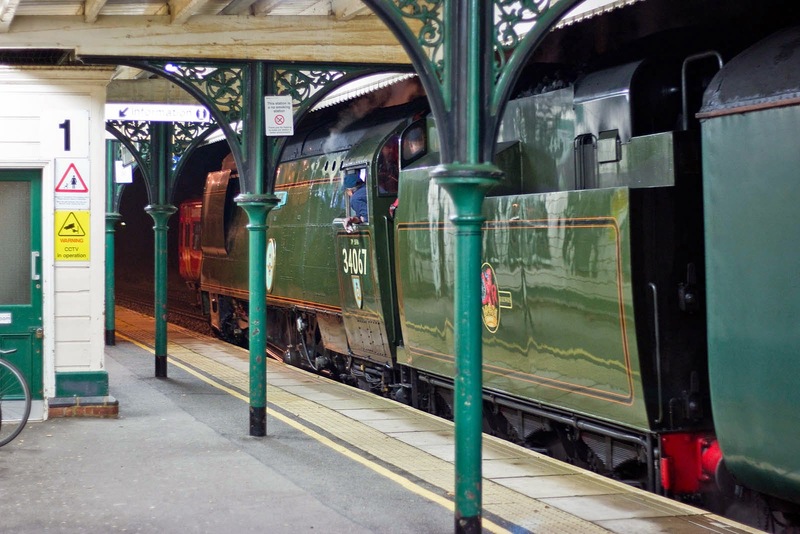 73109 (formerly Battle of Britain 50th Anniversary) and 73213, both for bogie overhauls. 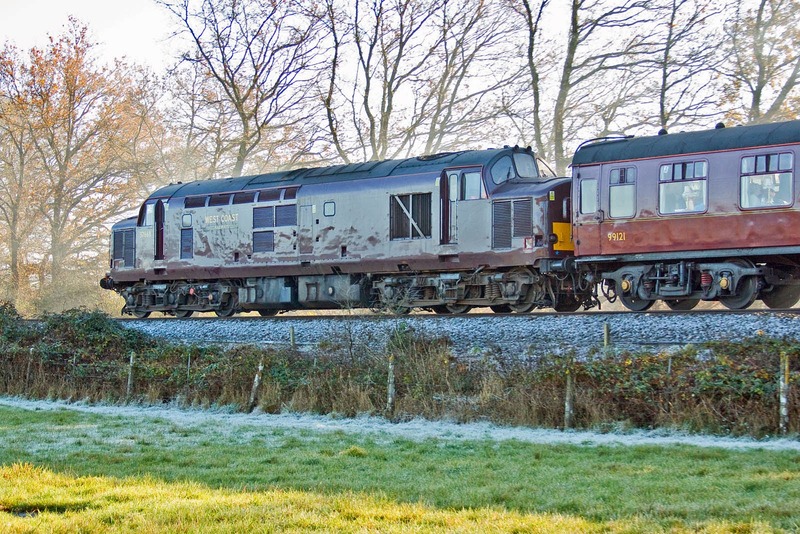 De-icer coaches 68505 and 68501. 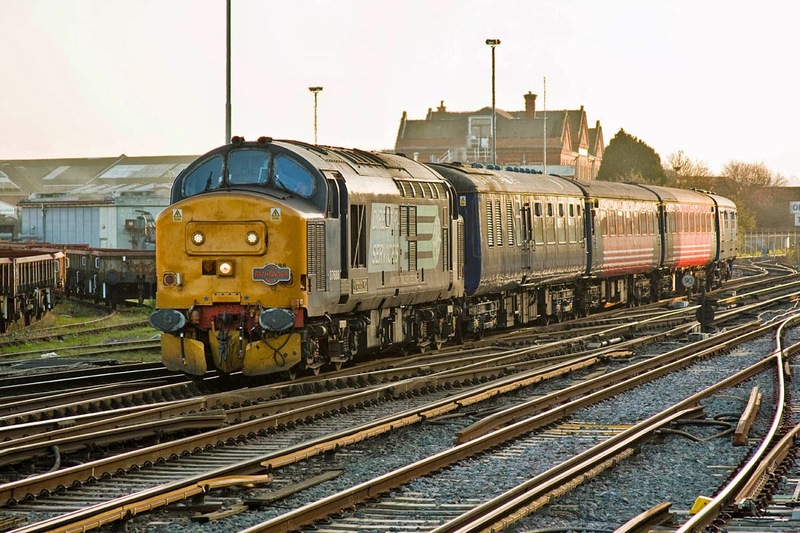 Originally constructed as 61299 and 61281, 2-HAP (Class 414/3) DMBSOs, to Lot 30452 at Ashford (underframes) and Eastleigh (body) in September and July 1959 for sets 6101 and 6093. 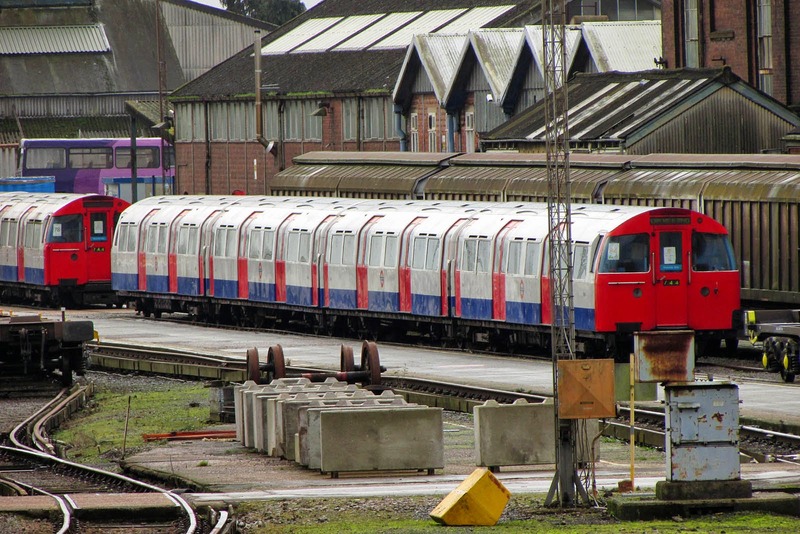 Converted to Class 489 DMLV for the Gatwick Express in March and January 1984(all respectively). 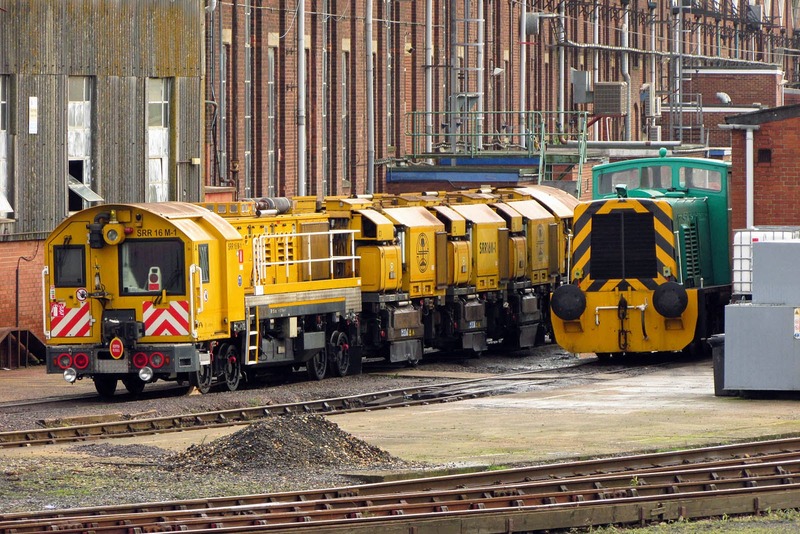 Speno SRR 16M-1 is a rail grinder, which has been used for tram systems in Brussels one two. Has been in UK since at least September. 08790 Steve Purser, which has been at Oxley until moved to Eastleigh in June. New as D3958 in May 1960, allocated to 84E Tyseley. 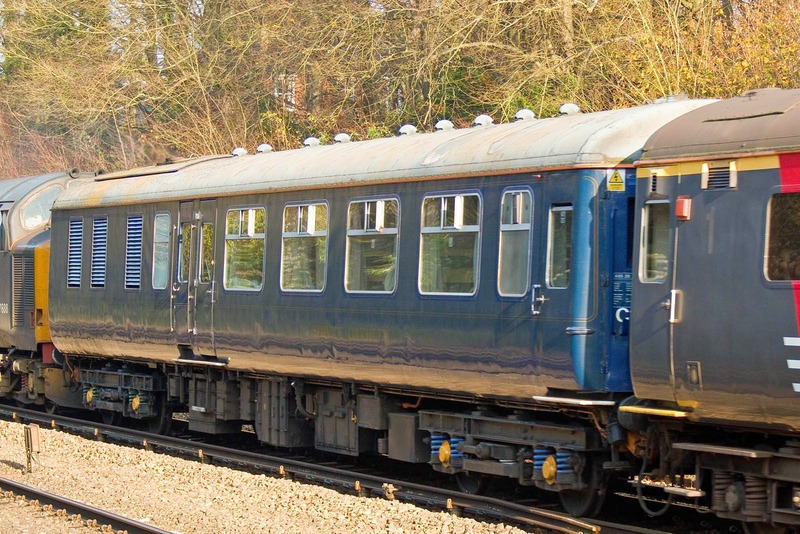 1972 Mk1 stock 3084 - delivered to Eastleigh in June 2011, for storage or disposal? Eastleigh Works Photos by Carl Watson - updated for November to December. 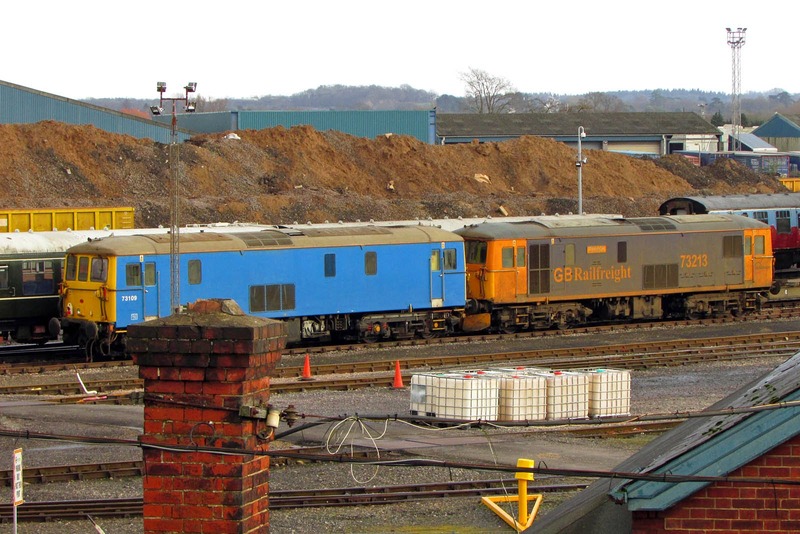 6 GBRf 66's parked at Eastleigh on Sunday 14th December. 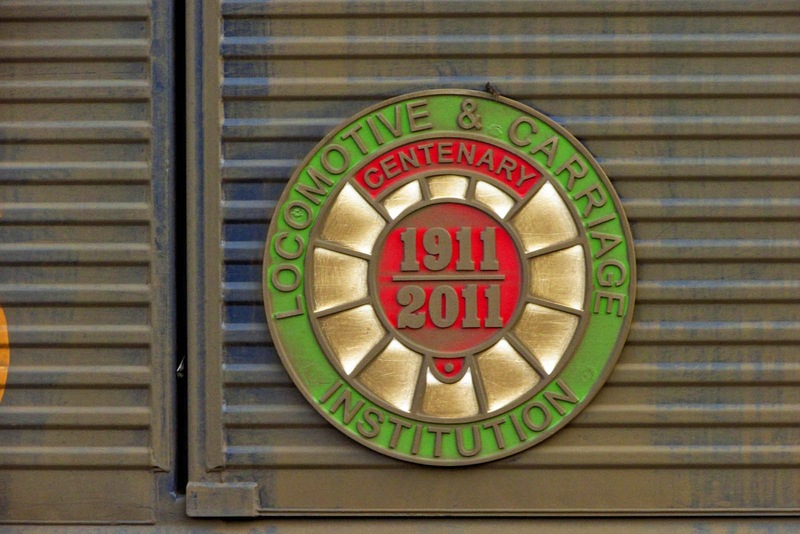 Nameplate of 66716. The naming ceremony was at Wansford on 14th May 2011. 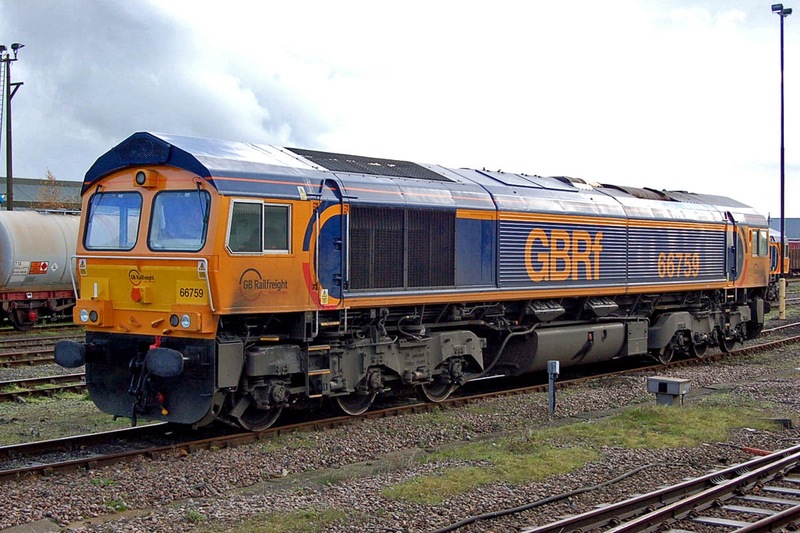 Original livery on 66706 Nene Valley, I am not sure why the silver surroundings are present at the windows, but they were also seen on 66701 while in paintshop. 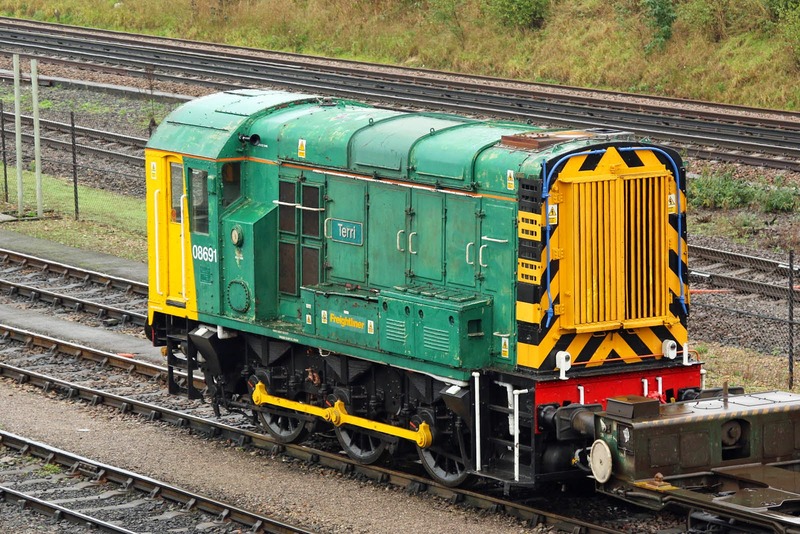 Railvac workings: DCR may have completed their workings of this train from Totton. 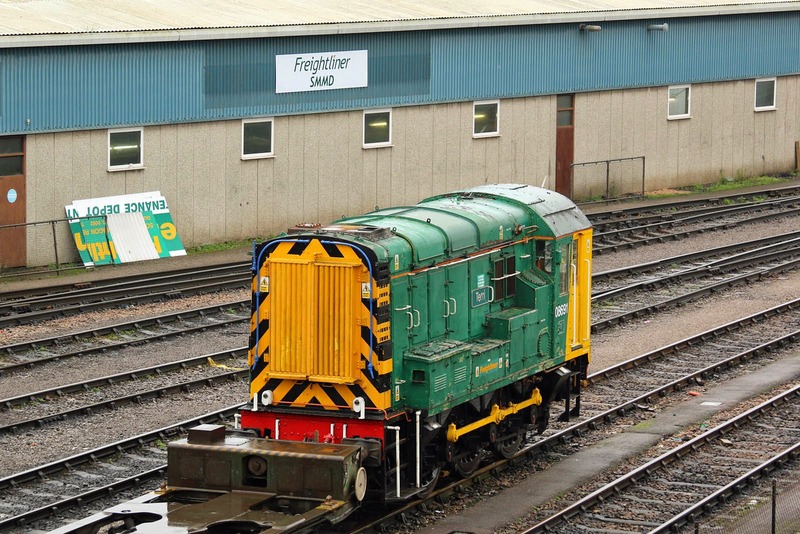 The Railvac is currently parked at Eastleigh. 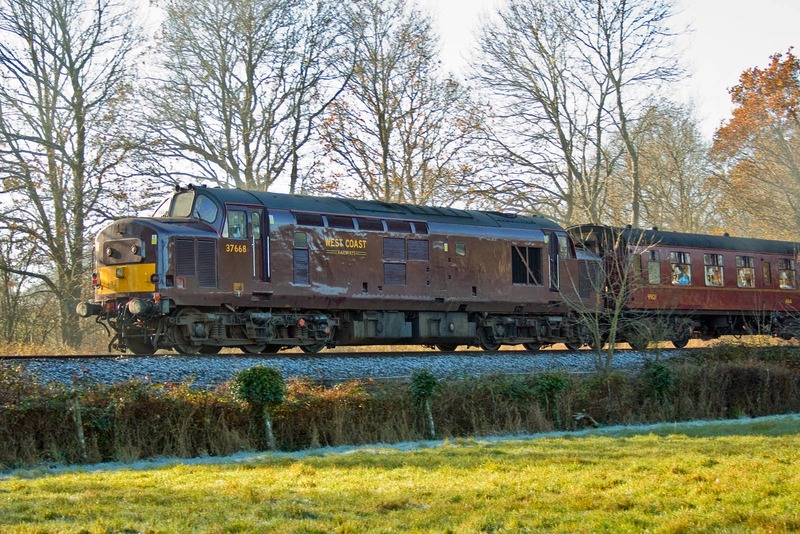 56301 made an exit to Barton Hill on Monday, and 56312 removed the wagons to Chaddesden on Tuesday. 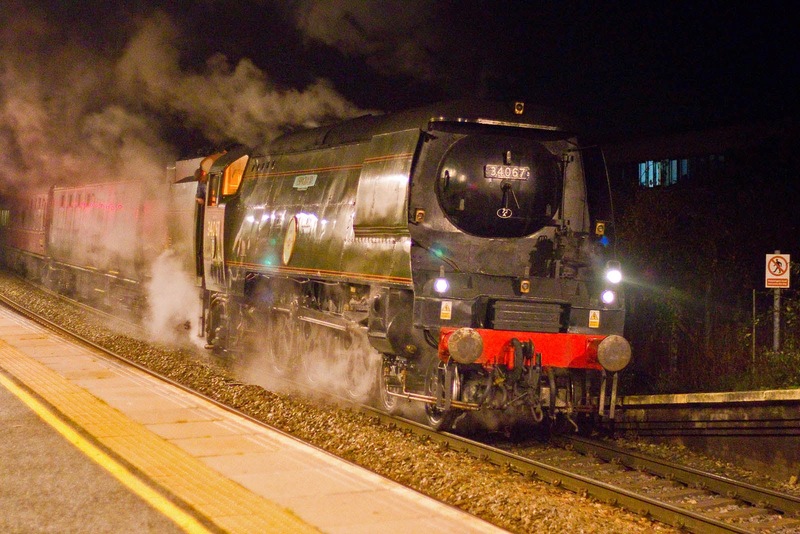 57312 Solway Princess at Eastleigh, 14th December. 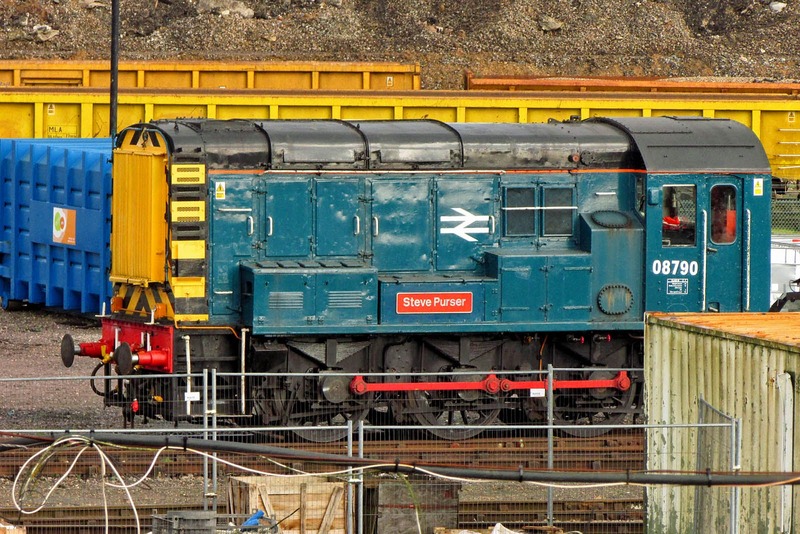 Originally 47330, new in February 1965, released from Eastleigh in these colours on 20th October. 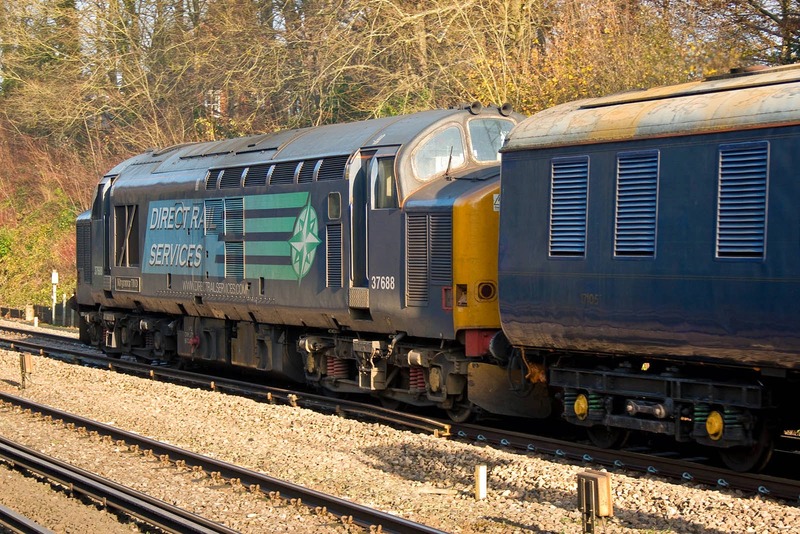 The name was previously carried by 47832, now with West Coast Railway Company. 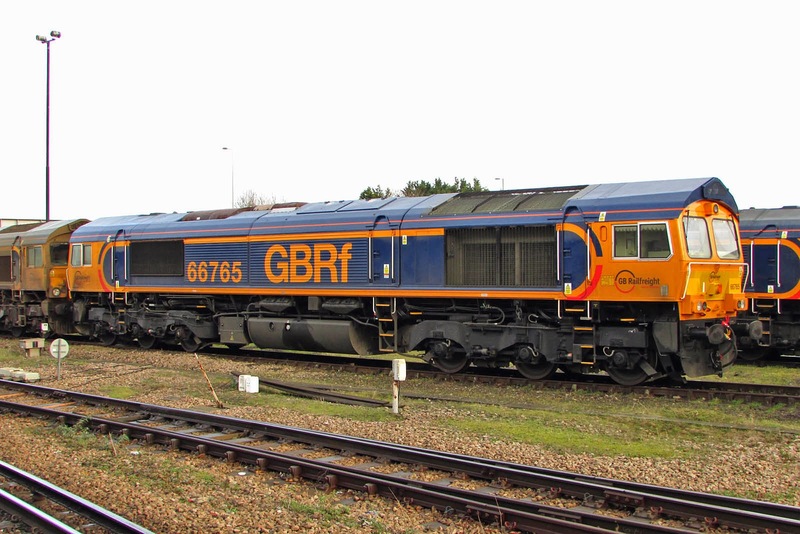 66765 at Eastleigh - the newest locomotive to visit here. 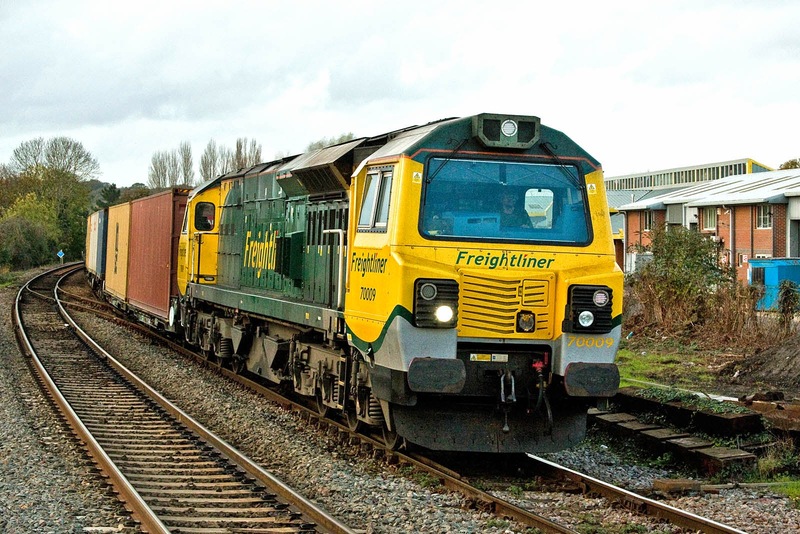 The highest numbered member of the batch delivered at Newport Docks in early September, which entered traffic in late October. 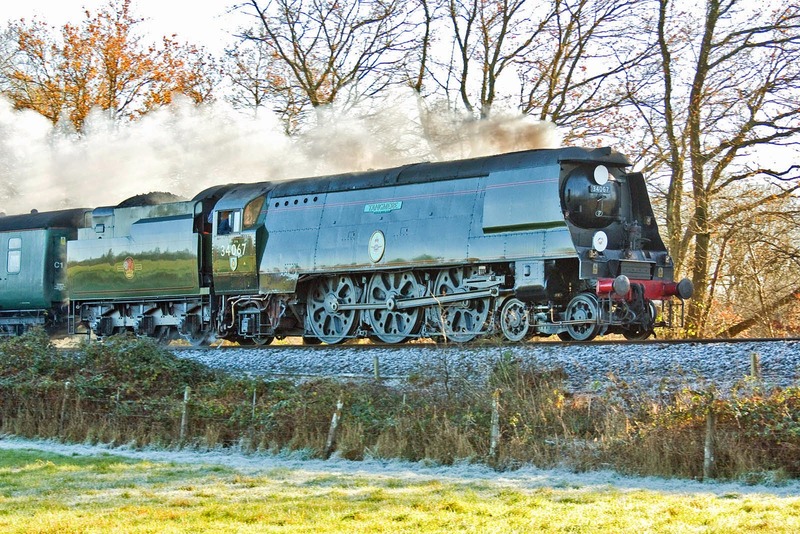 34067 Tangmere "The Bath Christmas Market" 1Z85 17:33 Bristol - Three Bridges. 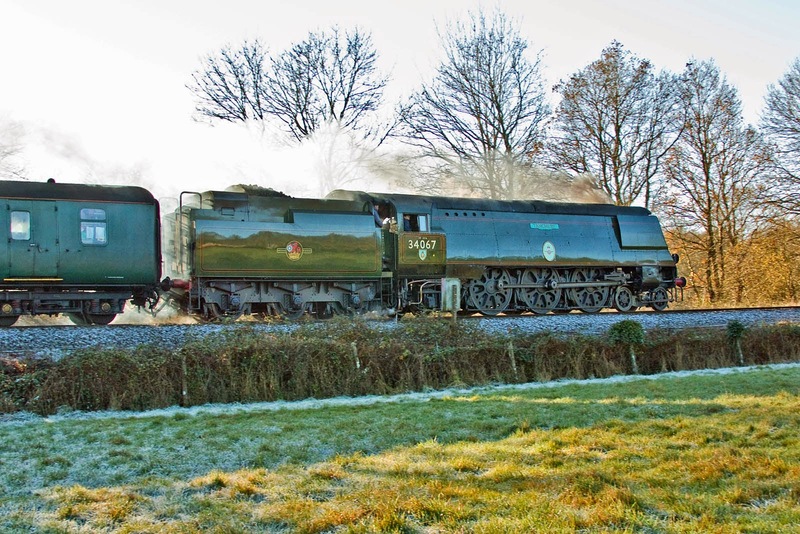 34067 Tangmere leads 1Z84 07:54 Three Bridges - Bristol "The Bath Christmas Market" past Crampmoor, with frost on the ground. 37668 (a first time spot for me) was completed as D6957 from English Electric Vulcan Foundry in January 1965, allocated to Cardiff Canton. 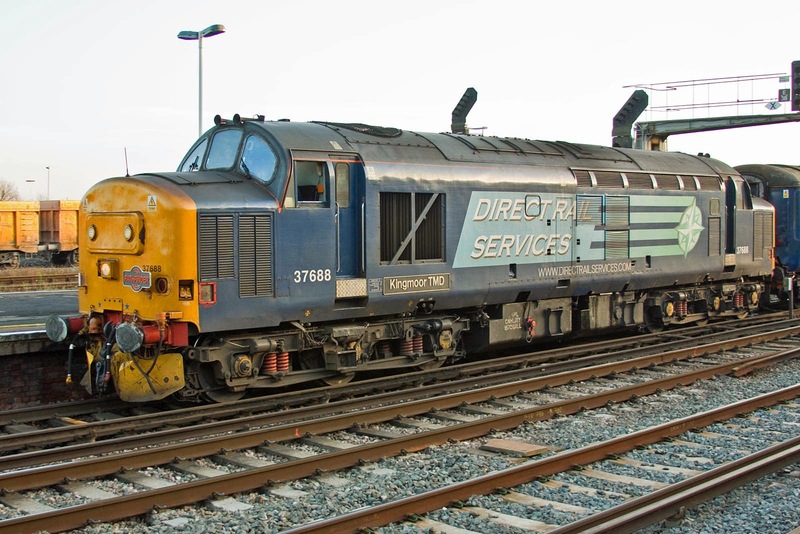 Later 37257, it was refurbished to 37668 at Crewe, completed in May 1988, and allocated to Thornaby. 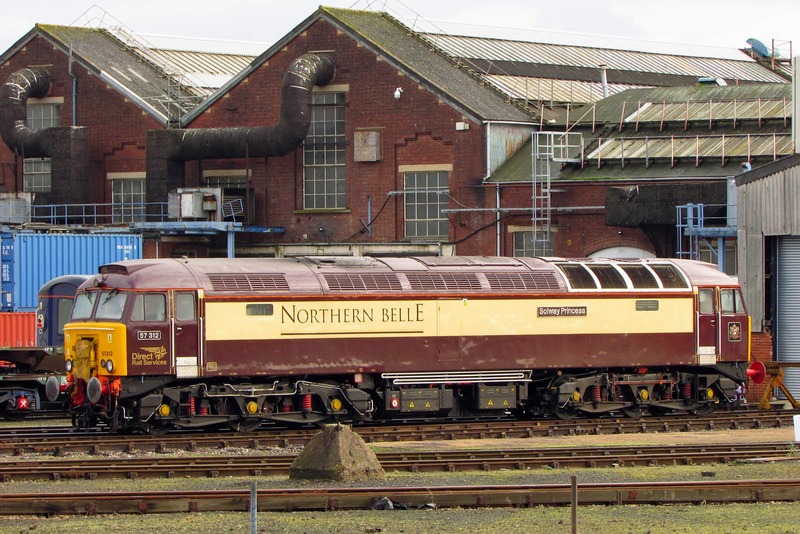 After some seasons on Sandite duties, it was stored by EWS in December 2004, and placed into storage at Healey Mills until purchase by West Coast Railway Company in December 2007. Returned to traffic in July 2014. 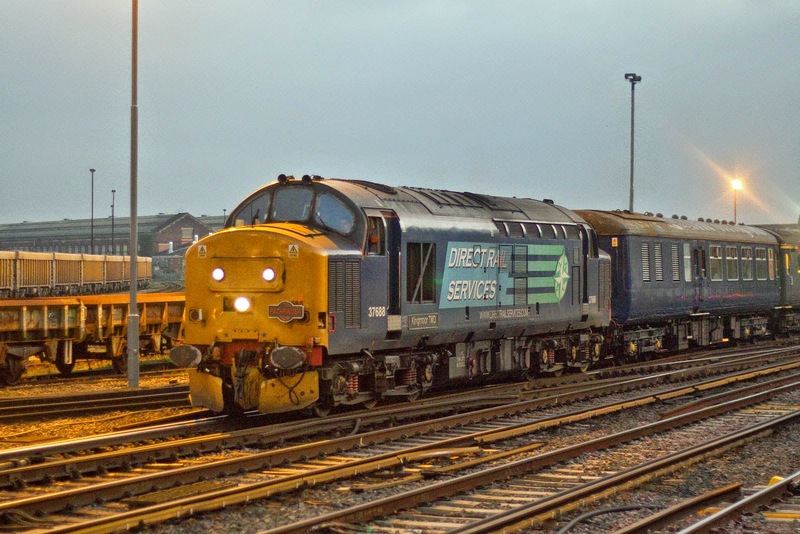 37688 Kingmoor TMD leads in from Portsmouth to complete the working of 1Z36. 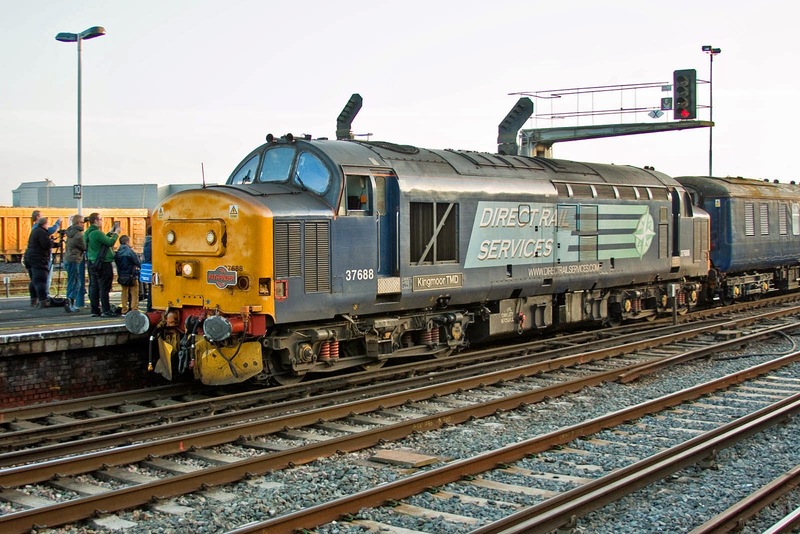 37688 was completed at English Electric Vulcan Foundry in November 1963 as D6905 and allocated to Landore. Refurbished at Crewe and reallocated to Tinsley as 37688 in February 1987. 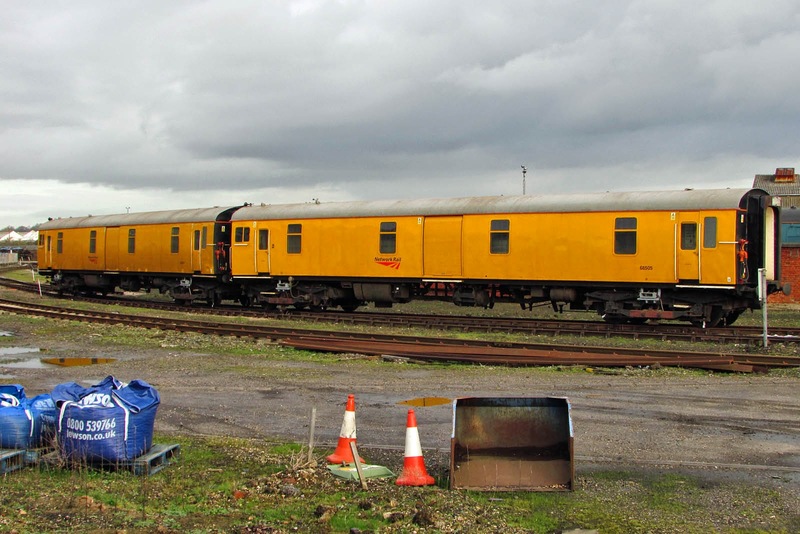 Moved into reserve by EWS after Sandite duties in November 2003, and sold to DRS in September 2005, returning to traffic after repairs in August 2007. 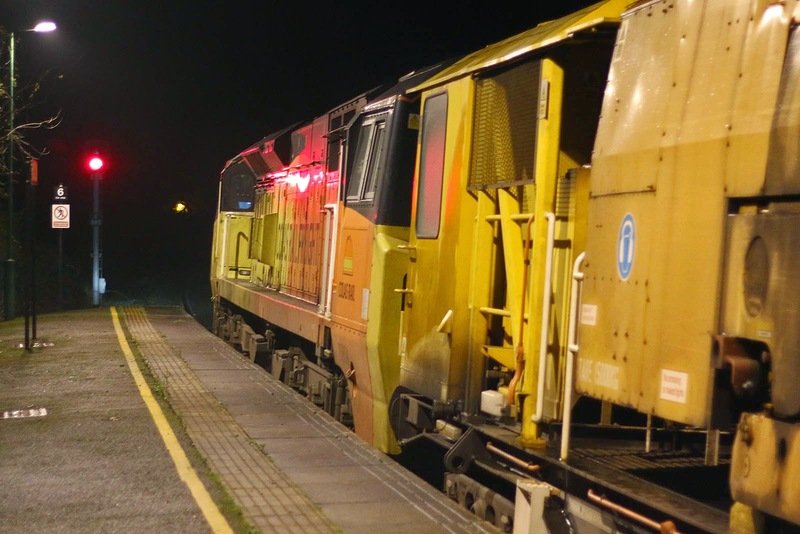 37218 waits to move the stock into the TRSMD. At 16:26 37688 brings the empty stock back into the station. 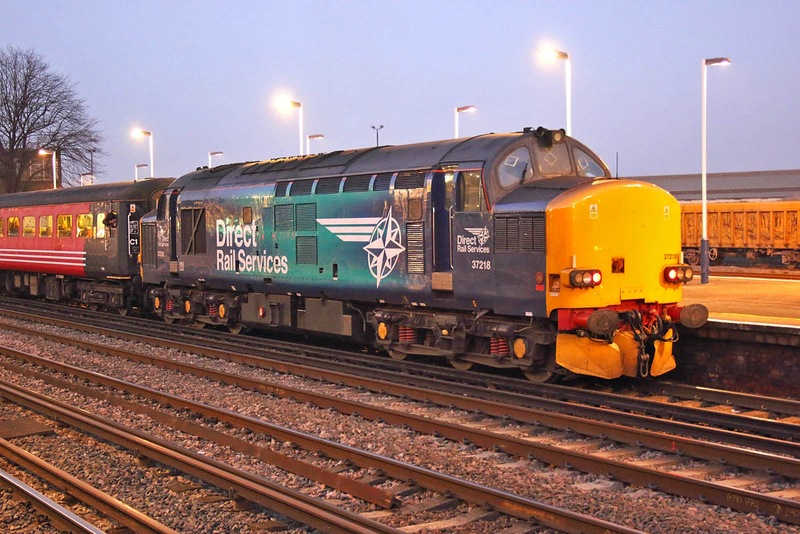 37218 is prepared for the return to Portsmouth, and later to Stafford. 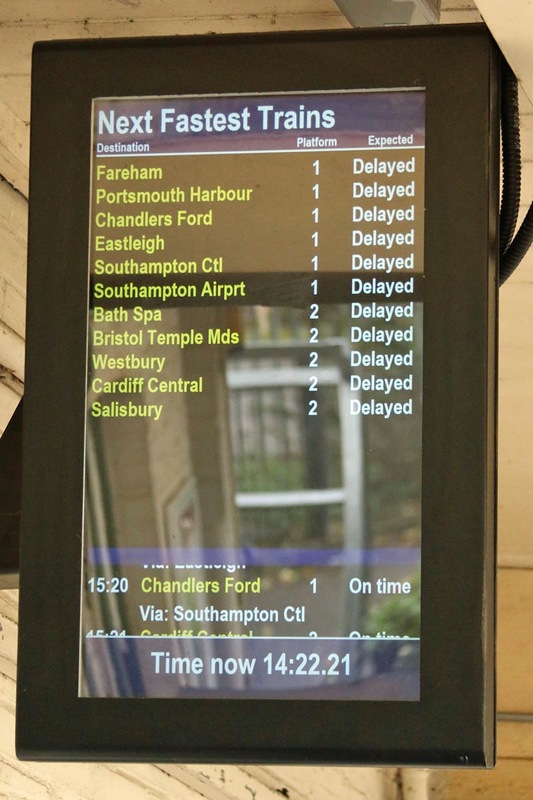 Operation was one hour late following non-availability of a platform at Swindon, as another train was timetabled to be in platform for that period, then a medical emergency caused further delay at Swindon on the revised return schedule. 37218 leads into Shawford on the down slow with 1Z36 07:02 Stafford - Portsmouth Harbour - Eastleigh, running about one hour late, after a lot of time was lost at Swindon. 37218 was built as D6918 by English Electric, entering traffic in January 1964 at Landore. Stored by EWS in September 1998, and restored to traffic by DRS in early 2003. Latest DRS colours were applied in May this year. 37688 Kingmoor TMD on the rear. 70019 leads 4O27 05:26 Garston to Maritime. 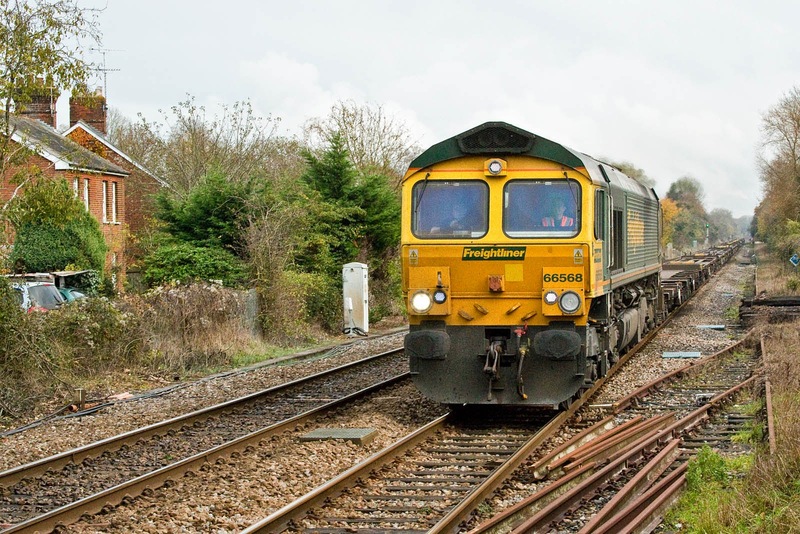 70804 on a CE and Balfour Beatty Kirow Crane move, waiting at and starting from Romsey. The crane is Kirow 100 tonne KRC810UK DRK81602. 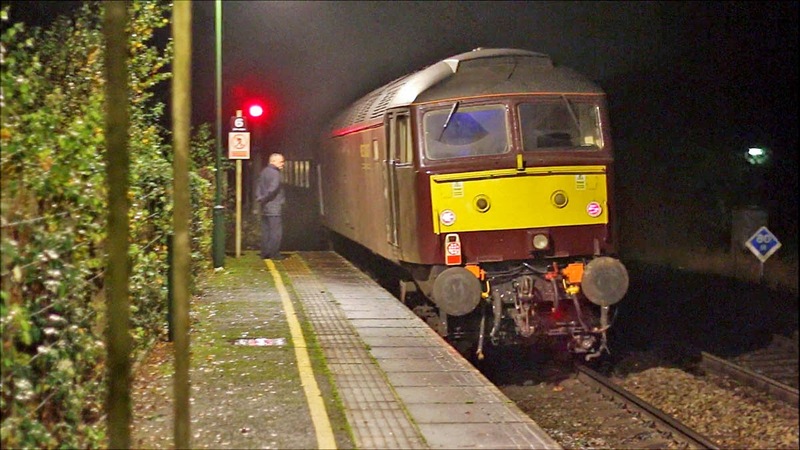 This train was 20:13 Eastleigh to Westbury but was running 50 minutes early. 70804 in a slight mist, awaiting a green signal. 1Z88 17:36 Bristol to Poole was halted at Romsey as the preceding 08:07 Romsey - Chandler's Ford - Salisbury was still in the other platform. 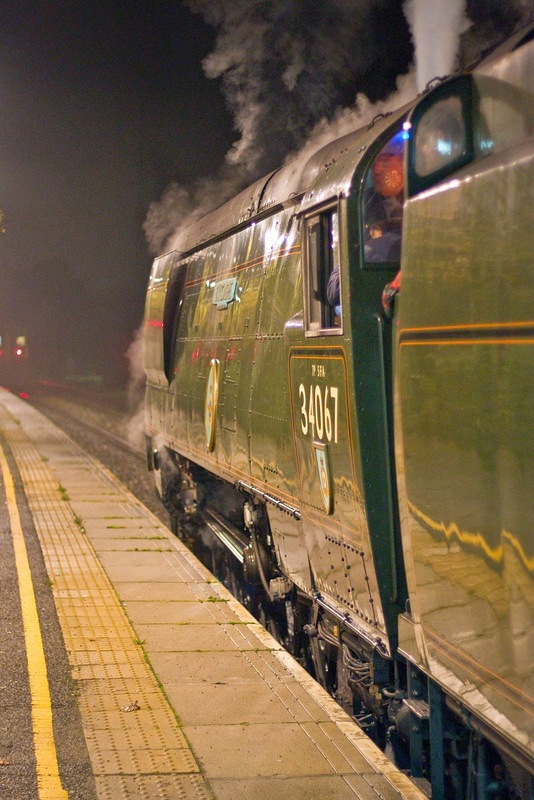 34067 Tangmere draws slowly into Romsey. It's strange how few people were there, the canopy is pure LSWR. All images were shot hand held, using available light and higher ISO settings. A few more at OneDrive. Newly returned 08691 Terri, along with new and old signs for the rather abrupt "SMMD". New as D3858 in October 1959, allocated to 27E Walton on the Hill. 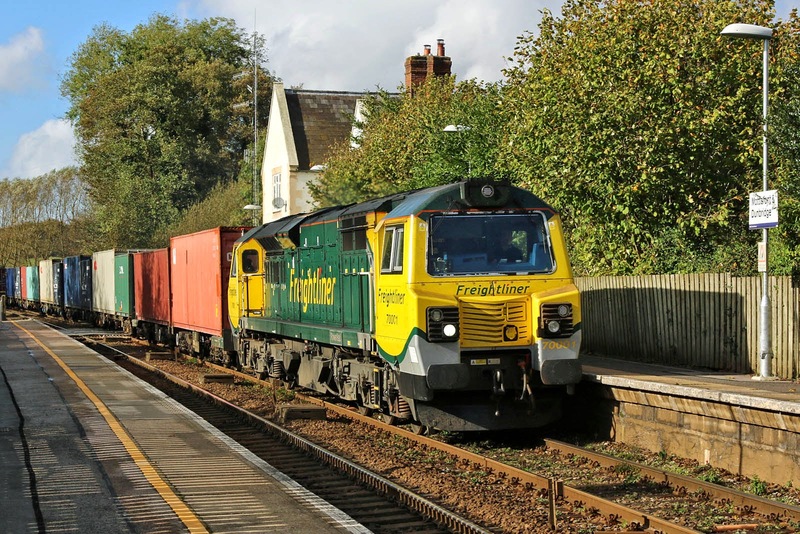 "The Route Study anticipates a requirement in Control Period 6 for a third freight path between Southampton Docks and the Midlands/North, operating via Laverstock Junction owing to capacity constraints on the more direct route via Winchester. 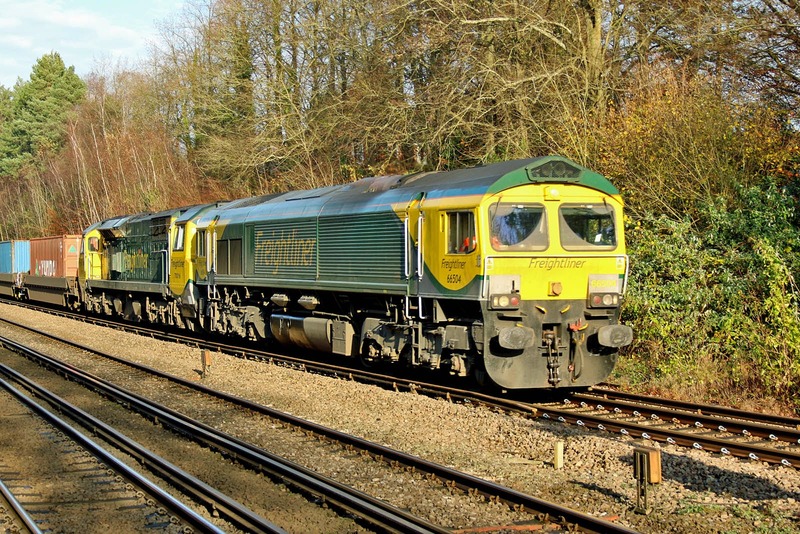 In order to path this additional train alongside the existing trains in the Basingstoke area robustly, grade separation of Basingstoke Junction is required to eliminate conflicts between Southampton bound freight and passenger paths and those existing passenger services operating on the South West Main Line. 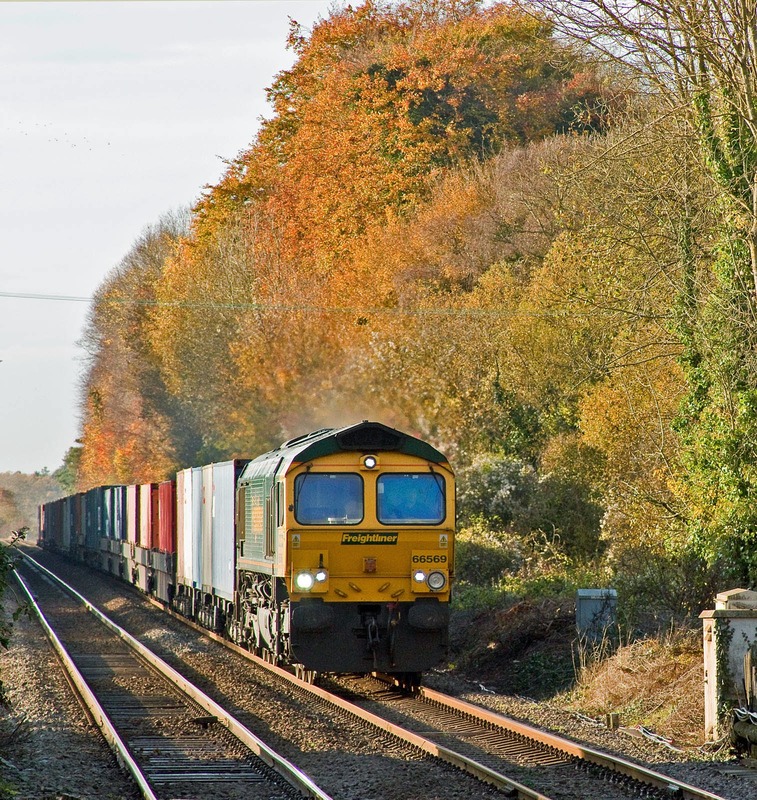 Hence it is the additional freight path in CP6 that provides the driver of the need for the basic grade separation of the junction. 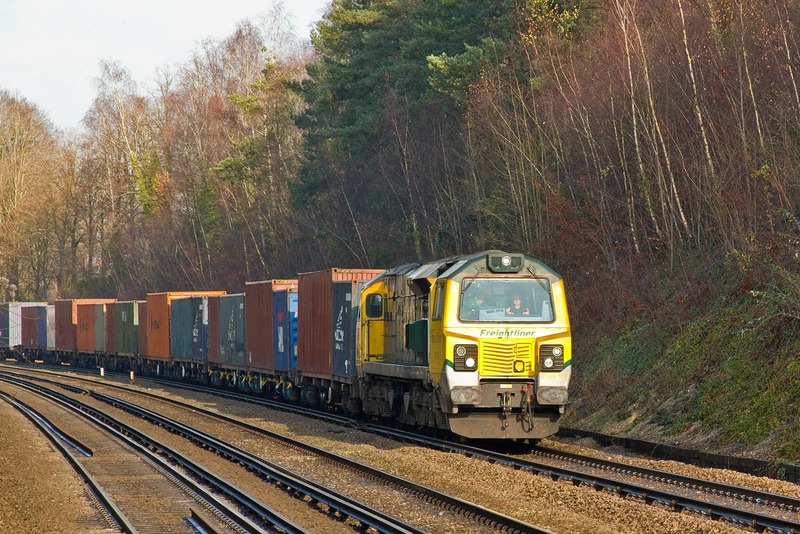 Initial development work suggests that the capital cost of basic grade separation of Basingstoke Junction is in the range between £75 million and £175 million (Anticipated Final Cost, in 2014 prices). 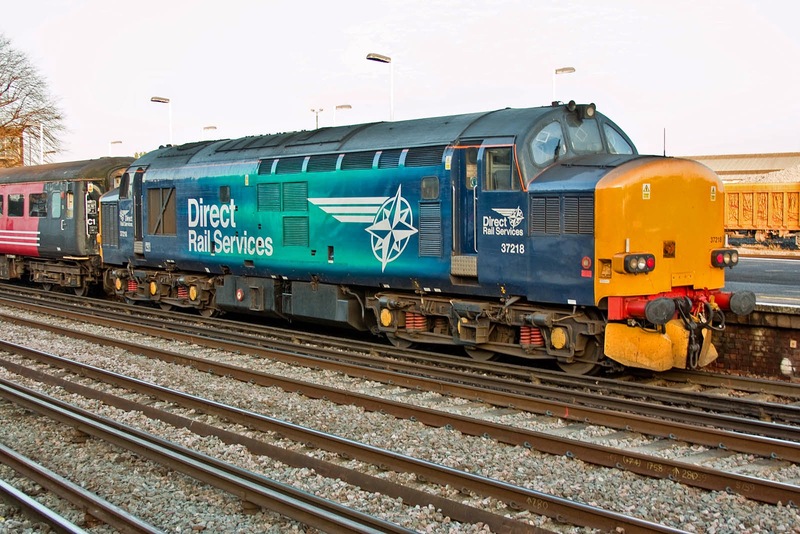 "As part of the Electric Spine concept it is intended to provide 25kV AC overhead line electrification between Basingstoke and the docks at Southampton at some point during CP6. 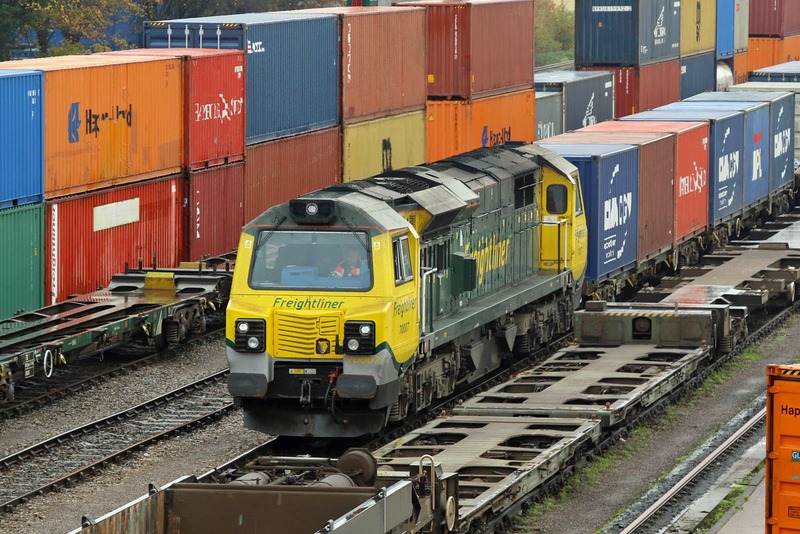 This could enable a large proportion of intermodal freight traffic to and from the port to be electrically hauled (potentially playing a part in enabling longer, heavier trains to be operated, and therefore using capacity more efficiently), as well as being an incremental step towards the electric operation of cross-country passenger trains. 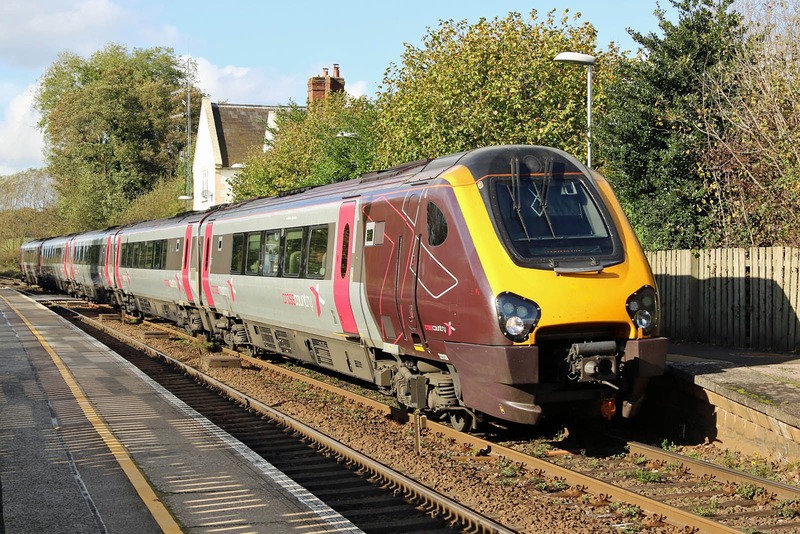 Given the position of this national scheme in the Department for Transport’s High Level Output Statement (HLOS) for CP5, the Route Study has treated this option as baseline and has not undertaken further analysis on the case for such an intervention. • from an asset management and maintenance perspective, the scope of AC electrification may be insufficient to offer efficiencies of scale. 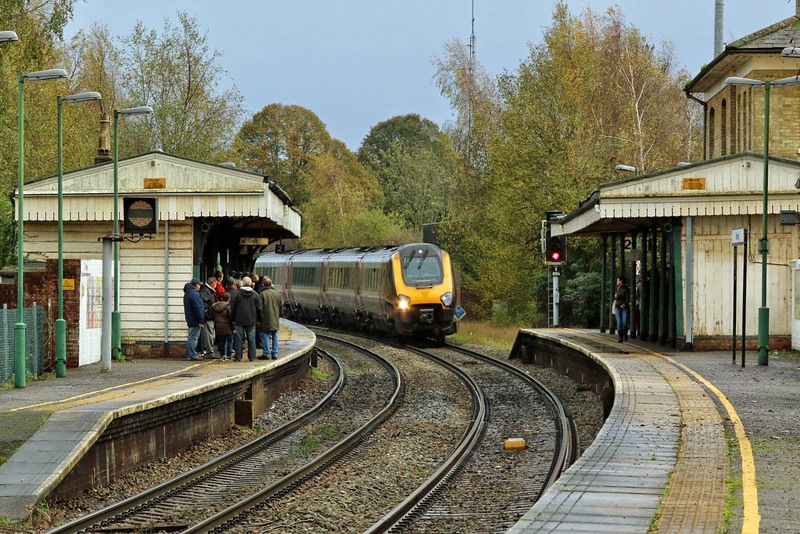 For these reasons it is proposed to extend the scope of the Southampton to Basingstoke project to include consideration of electrification of the lines between Basingstoke and Salisbury (including the Laverstock loop), between Salisbury and Redbridge, and possibly between Romsey and Eastleigh. 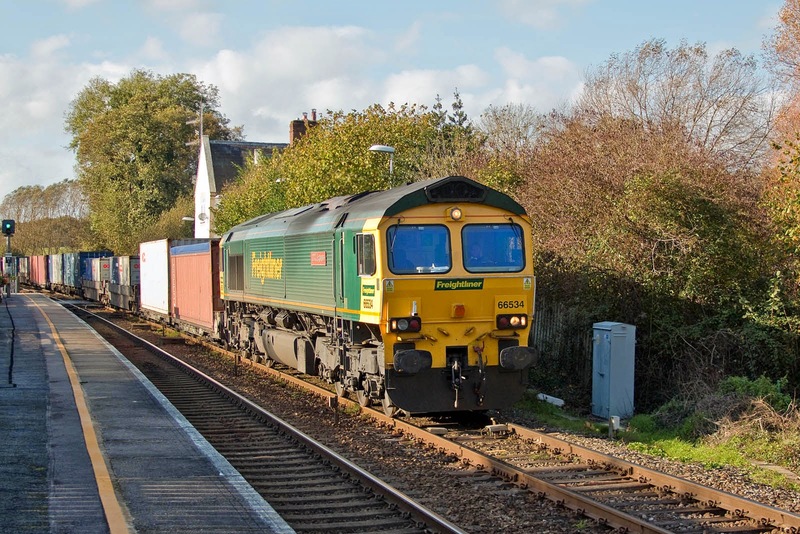 This would provide an electrified diversionary route for freight, and offer the potential for electric operation of Waterloo to Salisbury passenger services, and Salisbury to Southampton local passenger services. 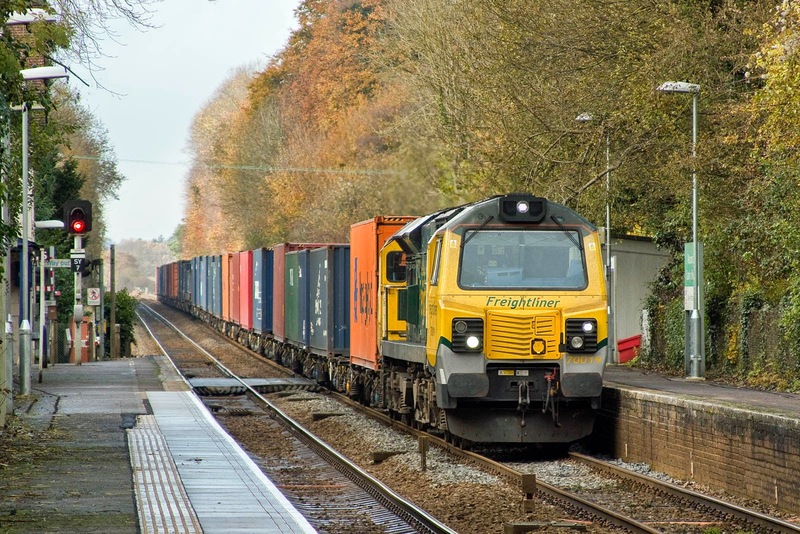 66759 at Eastleigh, 14th November.Image by Ian Knight. 66569 with 4O54 05:27 Leeds - Maritime. 70019 with 4O27 05:26 Garston - Maritime. 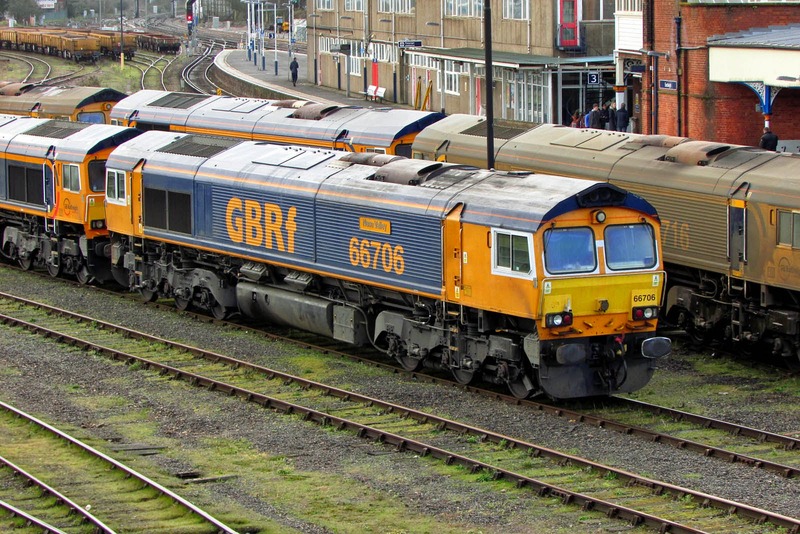 66746 with 6Y41 (?) 09:28 Eastleigh - Hoo Jct., running 116 minutes late. 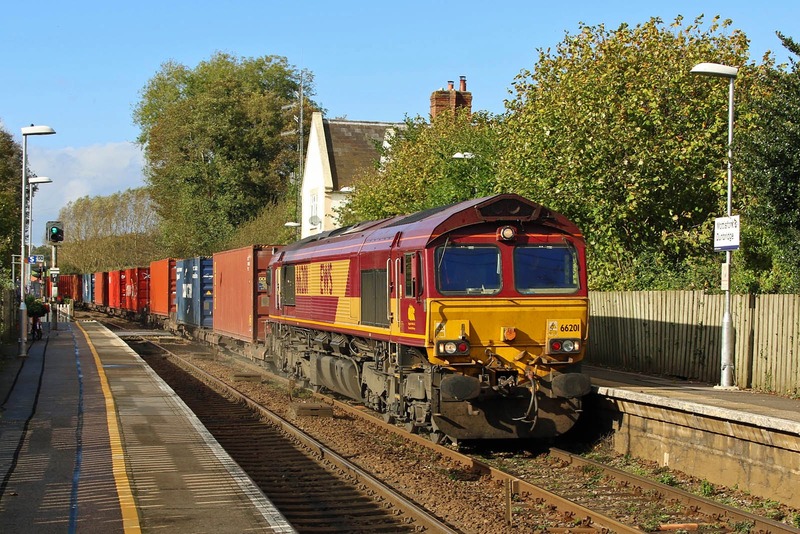 66568 with 4M61 12:58 Maritime - Hams Hall. 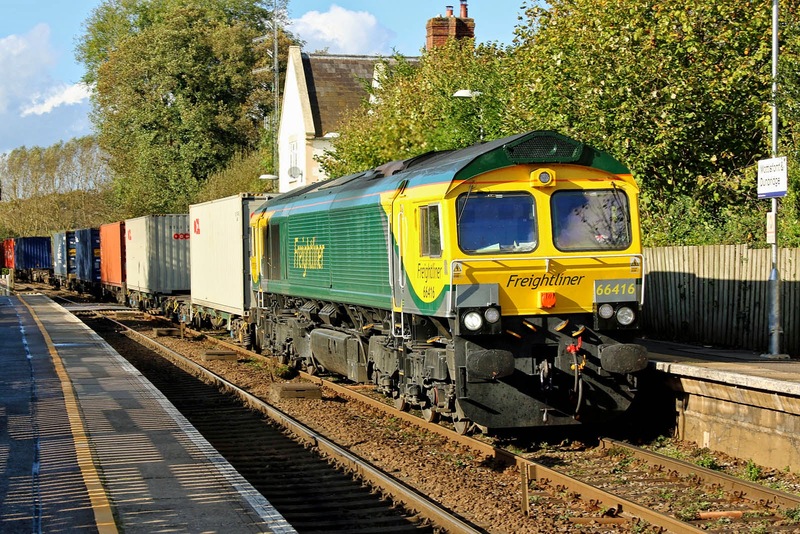 66588 paused at Romsey station, which I assume was crew change related, while working 4O14 07:37 Hams Hall - Maritime. 70003 passes under dark skies with 4O27 05:26 Garston - Maritime. 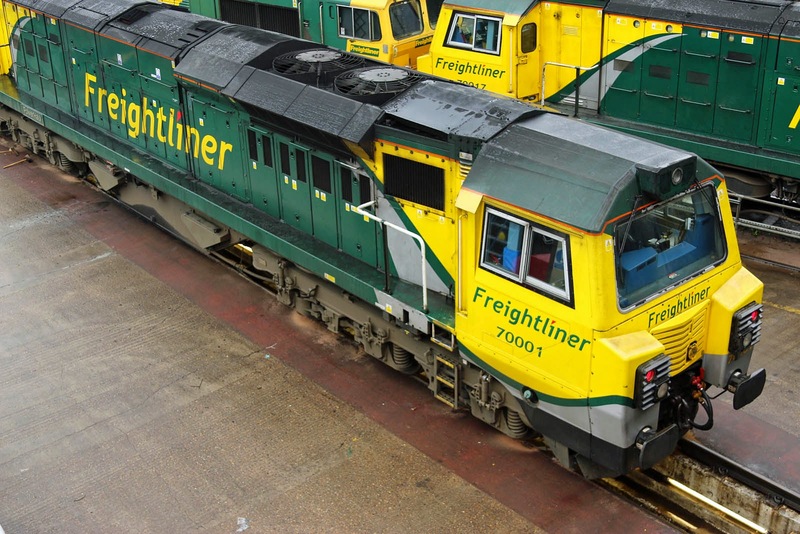 70003 is a Heavy Haul locomotive, but is in Intermodal service following modifications completed in late October. 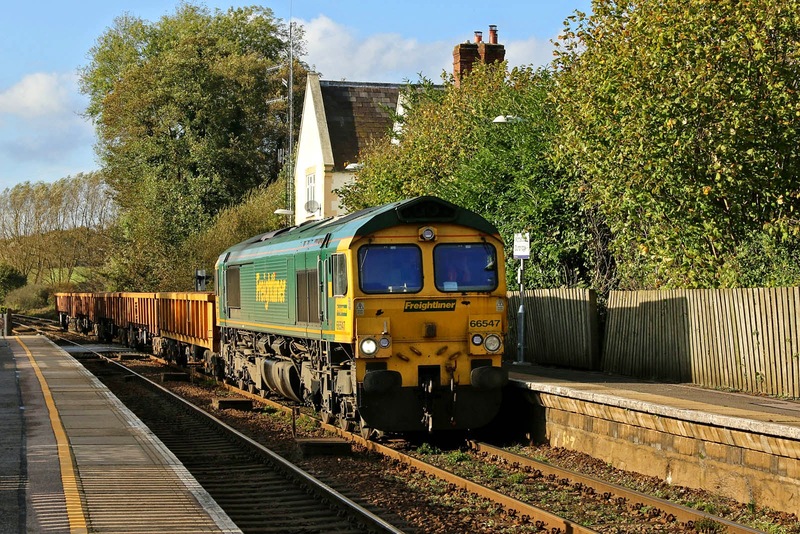 66572 pauses for a red signal at Romsey with 4M61 12:58 Maritime - Hams Hall. 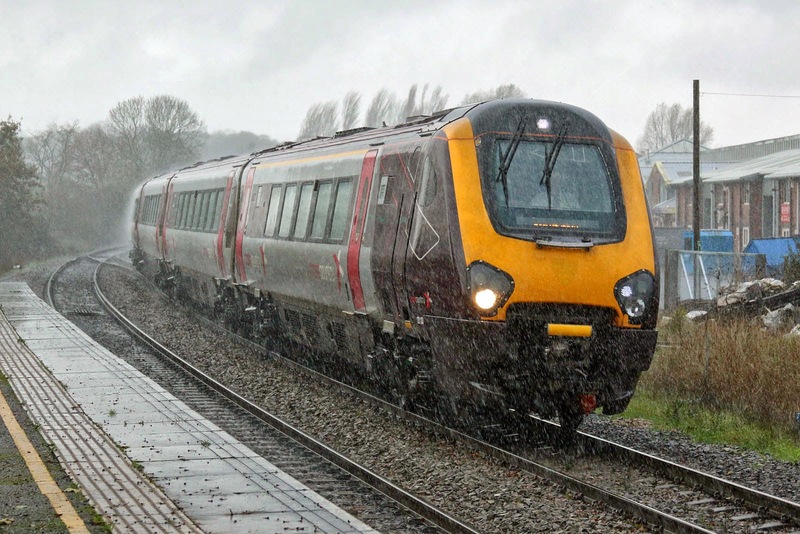 The train would shortly be delayed by 40 minutes by flooding in the Dean area. 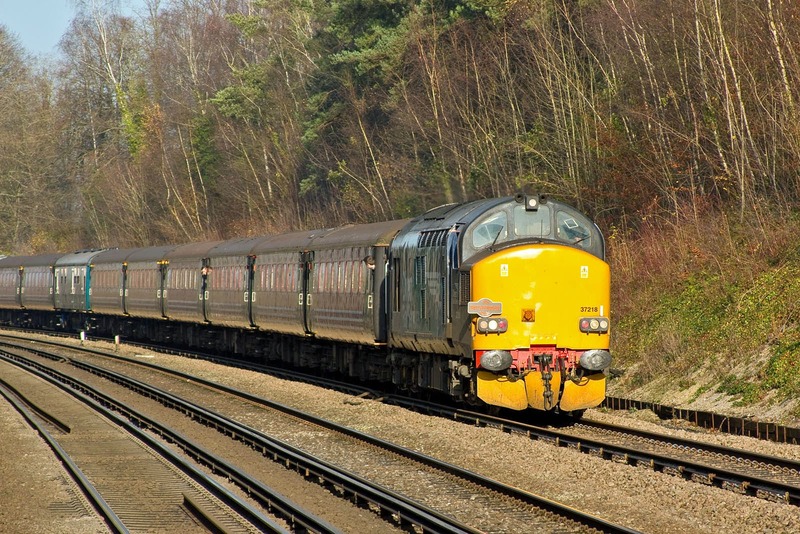 The deluge, which only lasted about 5 minutes, envelopes 221133 running as 1O10 08:27 Manchester - Bournemouth. 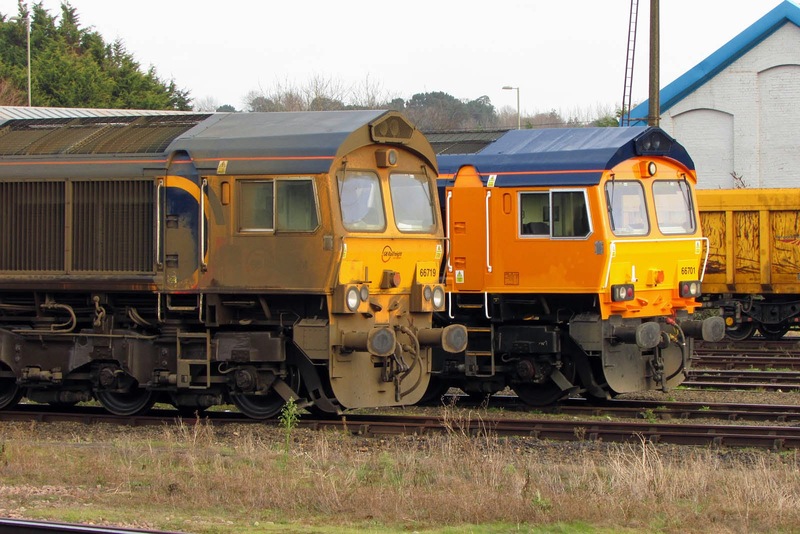 Some MPV operations, 3S80 and 3S82. DR98922 +DR98972 on 3S80 had been from Eastleigh to Havant, Guildford and return then to Warminster, to then return to Eastleigh via Chandler's Ford. DR98924 + DR98974 on 3S82 went firstly to Winchester,then via Southampton to Warminster, then to Basingstoke, Yeovil, and back via Southampton to Eastleigh.The rain had slackened off. 66957 Stephenson Locomotive Society 1909 - 2009 with 6O26 10:50 Hinksey - Eastleigh. This train had passed Dean about 13:30 and was the last train from there for some time following flooding. 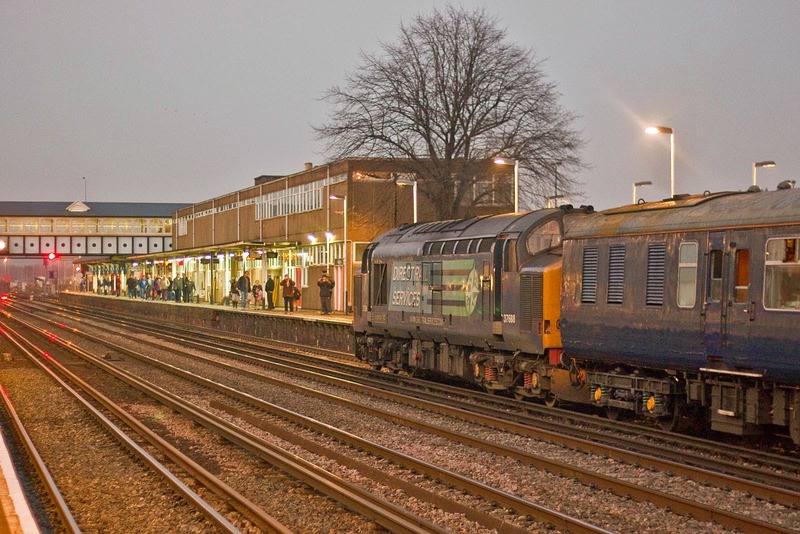 221139 arrives at Romsey against a red signal with 1M54 13:06 Bournemouth to Manchester. 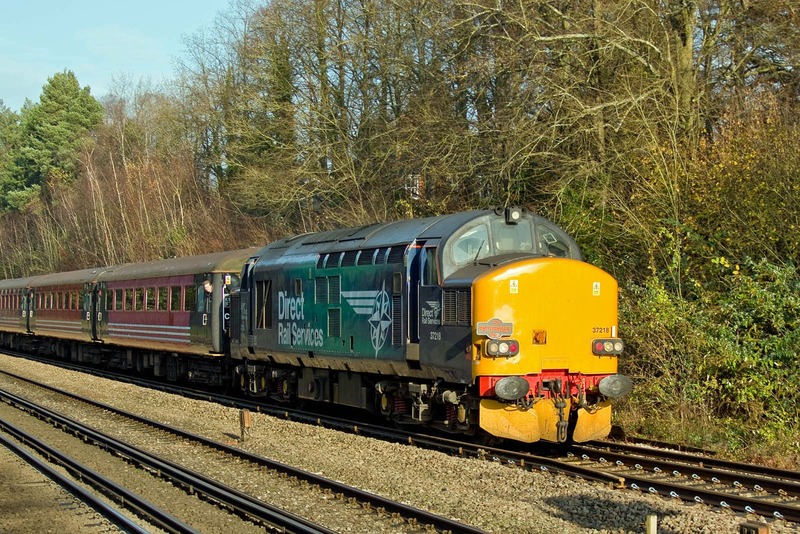 This was turned around at Romsey, and then rerouted via Southampton and the Portsmouth Direct to Reading, where it was terminated 93minutes late at 16:36. Passengers were already gathering for late trains. News was appearing on Twitter and displays started to deliver news of the disruption. I quit at that point. 4O54 05:27 Leeds to Maritime appears to have been delayed approaching Laverstock and then between Laverstock and Dean when the flood occurred, eventually passing Dean 91 minutes late. 4O29 08:14 Basford Hall to Maritime was sidelined between Basingstoke and Worting, resuming 94 minutes late, and eventually arriving 111 minutes late at 16:46. The 0O12 (? 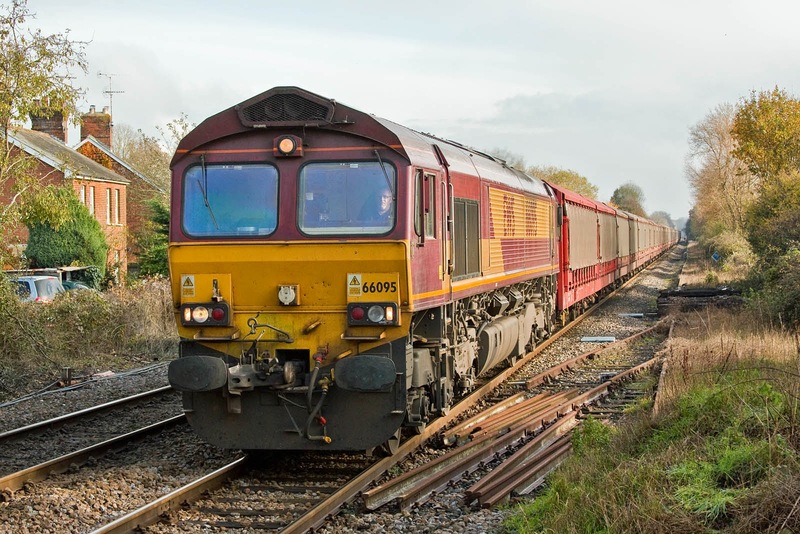 - ran as STP) EWS Class 66 convoy ran onwards from Westbury and was 7 minutes early. Finally, the cause of the problem. Brush "Falcon" found on a browse on RMWeb. Commentary by Richard Baker.